I have come to appreciate the Japanese diet. Or, what I think of as the Japanese diet. I think of this kind of meal as Japanese food, because my grandparents, both sets, came from Japan and spoke Japanese. So, in my mind, Japanese food is pre-World War II inaka-style (country-style) food, not the Japanese food of today. My grandparents ate like this. A fresh, simple, tasty meal. Did you know that Costco now has brown calrose rice? I discovered this barley while shopping one day at Nijiya Market. It was right next to the rice corner, near the mochigome. I love barley, so I bought a bag. How can you go wrong for around $2? My intent was to put it into soups and stews, like I use pearl barley, but on the back of the bag, there's a recipe for barley rice--and it's a natural progression to go from white to brown rice. The barley adds a wonderful chewiness to the brown rice, one that's a little different than the chewiness of the brown rice alone, and creates a nice variation. 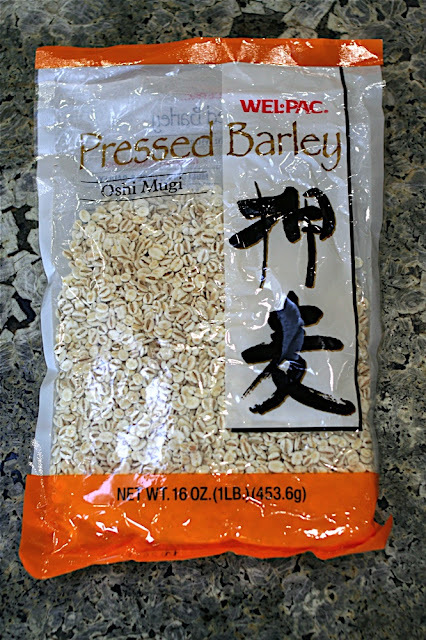 To make the Barley Brown Rice, you're going to mix 2 cups of brown rice with 1 cup of barley. Add 4 1/2 cups of water, bring to boil, reduce heat to the lowest setting on your stove, and cook for 45 minutes. Let sit for ten minutes more with the lid on before serving. I always make a little extra so I can have leftovers the next day. Are there any fellow umeboshi lovers out there? This is umeboshi. Japanese pickled plum. I remember eating it from a jar when I was little. It was SUPER sour and SUPER salty. Now, you can find them with only 5% salt, very mild and a lot less sour. You don't even need to eat them with rice, they're so good. I got these at Nijiya Market. No more umeboshi-face for me! To make the salted cucumbers, simply cut them up and sprinkle a little salt on them. These mini cucumbers are from Costco. The whole bag is $4.99. For the whole bag, I used two generous pinches of kosher salt, sprinkled it on and stirred them. That's it. Refrigerate the leftovers. They were gone the next day. My family loves them! They're also good, Mexican-style, with lemon juice, a little chili powder & cumin, but we have them just salted. 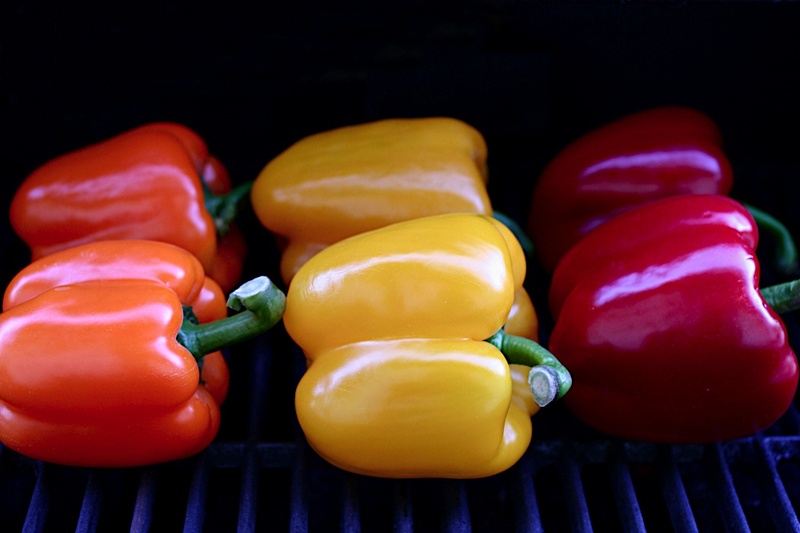 Grilled orange, yellow & red bell peppers. I hated bell peppers when I was little. My mom would make them stuffed, and I would eat the inside and throw the outside in a corner. I didn't start liking them until I ate them grilled at the Fujimoto's. Now I love them. 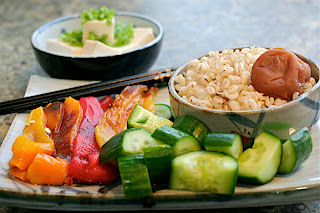 Grilled peppers & brown rice is a favorite meal of mine. Put them on the grill and turn them when the skin turns black. You can get these 6 at Costco for $6.49. It will make a lot, but you can use them in salads or pastas for the next few days. take them off the grill and put into a paper bag or a bowl with a lid, and let steam for a few minutes. Take them out when they're not too hot to handle and peel the skin off. It just slips right off. Take the stem and seeds out too. Slice the peppers into spears or the shape of your choice. Add some green ones for color. If you like heat, grill some pasilla chiles. They're meaty like this. All finished & ready to eat with a squeeze of lemon and a splash of shoyu. Add a small dish of tofu topped with grated fresh ginger and some thinly sliced green onions to round out your meal. Very simple. Fresh. Full of flavors. A meal like this, to me, is a Japanese meal. O-Baachan to O-Jiichan, arigatou gozaimashita.